By 2031 with the Project constructed, there will be marginal changes to total vehicle trips, vehicle hours travelled, traffic speed and public transport trips compared with not having the Project constructed. 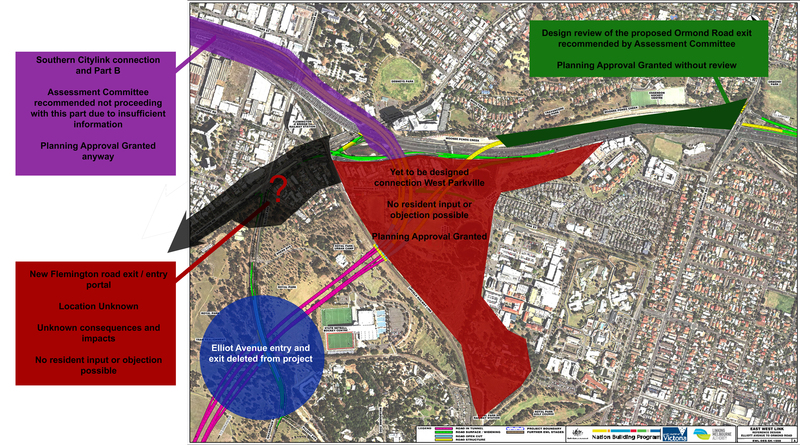 The Project will clearly reduce travel time on the route between Hoddle Street and CityLink /Tullamarine Freeway. However, traffic volume increases on the approach routes and CityLink /Tullamarine Freeway, combined with the Zenith model neglecting intersection delays, show the benefits will not be as significant as the LMA document suggests. The location of the western portal shown in the Reference Project is unacceptable, as is the horizontal and vertical alignment of the ramps from the western portal to CityLink. The Committee recommends further alternatives be investigated. 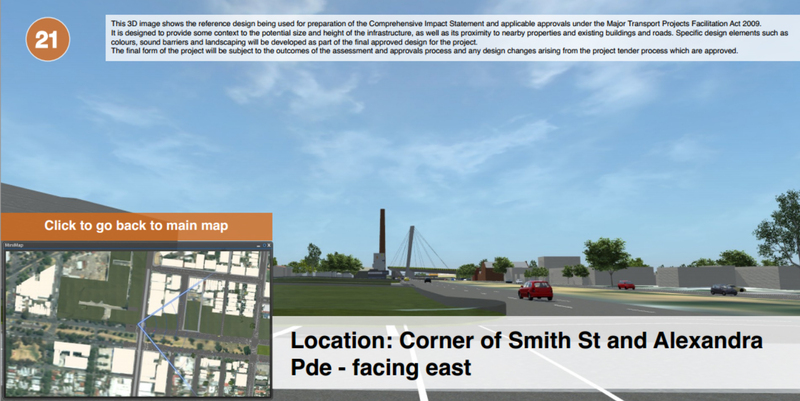 This entry was posted in all posts, construction industry, East West Link, Government Policy, Heritage, News, Uncategorized, Urban Design and tagged bad planning, East West Link, East West link planning approval, Matthew Guy. Bookmark the permalink. I’m so confused about this whole situation. For presumably political reasons I don’t understand, there is a rush on this project which the committee acknowledged is one of the causes of the LMA’s poor design, let alone the rushed process. I think it’s important to compare the process to what would happen if a homeowner wanted to do an extension. Our homeowner, let’s call her Lee, decides she wants to subdivide her suburban property. First, she will spend some time deciding if this is the best option for her. She will consider many things she could do, sell, rent, hold, rebuild. She will consider the probable financial outcomes of each scenario. She will probably keep records of what she thought would happen in each situation to refer to later or to discuss with her husband. Ideally, our state government would look at the problem of congestion along Alexandra Pde and consider all of the options. Where do people want to go? When? What other options would suit? And even is this the best way to spend transport budget across the state. They would compare this problem with regional transport issues and find out where their money could best be spent. They would also be able to show their working. They could show the public their calculations and reasons for choosing to build a road. We are the ones paying for it, after all. So now Lee has chosen to subdivide and build a second house and the government has chosen to build a house. Lee’s next step might be to figure out a design. She will probably consult with a design expert, her husband, her daughters, her neighbors and local council in order to find a design which works well. There will be iterations where people provide feedback and serious concerns will be taken on board. There are rules guarding people who live near her. If she wanted to cut down any of the trees in her front yard, she would need special permits and she would have to plant trees to make up for it. Ideally, the government would follow a similar process. If they were planning to remove park or houses or community assets or change communities or ruin council plans or put elevated road structure next to homes or remove heritage buildings for a temporary road, then they would include all involved parties in the planning. They would find a way to compensate anyone who would lose out. Now let’s suppose everything is planned and we want council approval. Lee has to take her project to council. There will be a giant yellow sign in front of her house advertising the planning process. People nearby will have letters advising them about the process. If council decides she can build the project, a single neighbor who disapproves can take the case to VCAT, a branch of the Supreme Court. Ideally, the government would have to follow the same process. What actually happened is that the media told us about the what we thought was the project. Of course, this was only a reference project. The only place on the process for community feedback is not based on an actual plan. It could change in unknown ways. We don’t know what is certain. Through community and the internet, some of us found out that there was going to be a planning panel hearing. We wrote submissions, we took time off work, we prepared presentations, we spoke to the panel. This was our only hope of having a say in the process. Many of our neighbors didn’t know about the process. It wasn’t clear that the second stage was part of the process. Anyone who struggles with the internet or English was underrepresented. The planning committee were great. They listened to 30 days of submissions. And they came out with a detailed set of recommendations, including significant redesign. Matthew Guy “looked at” this report and took on two of the recommendations. He approved stage 1, and he removed the terrible Elliot Avenue interchange. He seems to have ignored pretty much everything else in the report. So now Matthew Guy has approved an undesigned project. There need to be detailed designs drawn up “subject to the Minister’s approval.” It is not at all clear what the Minister will approve. For a final comparison, if Lee wanted to change the location of one of her street facing windows, then not only does she have to go back to council, but council will most likely re advertise, seeking public opinion again. Why is the government not held to the same standards as the rest of us? Why can they spend our money without showing a business case? Why can they ruin homes and communities at will? Why have they left me crying over planning permits?